This is a wise and timely book, grown out of a passion for thinking as it is intensely connected to doing. 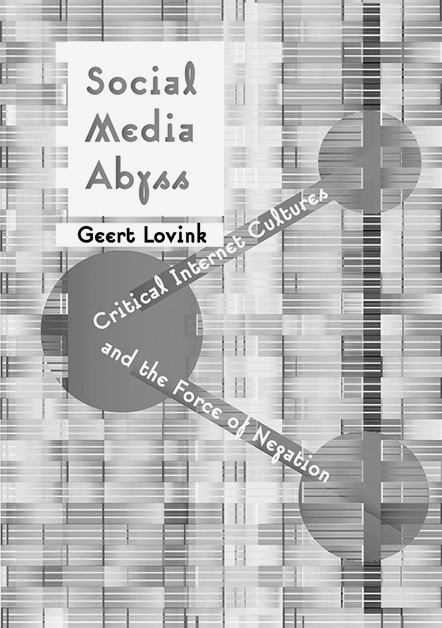 In his latest book, network cultures theorist and activist Geert Lovink scrutinizes the net behaviour of providers and users, making painfully clear the long-term consequences if we continue to uncritically bond our lives to social media platforms. While arguing for inventive forms of disengagement from the virtual world he admits that it would be difficult ‘to lose interest in something designed to be vital’. He insists on reinvigorating our attention to code and network architecture while at the same time warning against offline romanticism. He sees politicizing hidden online infrastructures and making their workings public as an important step in retaking some control and rebuilding trust among users. By asking why the Internet has not been maintained as a public infrastructure from the beginning, he reminds us how the potential for redistributive practices has been hampered by Silicon Valley. He bravely proposes crowd funding as a system for producing the commons, where private inputs are translated into common outcomes. Recent initiatives within the art context involve Art Basel teaming up with Kickstarter and the UK-based platform Art Happens; the former supporting future projects and the latter devoted to restoration inside regional museum collections. Crowdfunding brings attention to preferences set up by private interests, but it can help to open up people’s needs to be part of a meaningful campaign by linking social conscience with emotional rewards. It gives a chance to turning ownership into a sense of belonging. A more problematic aspect remains its one-off dimension. The issue of trust is explored again when he observes how the emergence of Bitcoin coincides with the Occupy movement, positioning the invention of the crypto-currency as a ‘longing for technology-aided liberation from inequitable regulation’. And yet from the perspective of social movements fighting for solidarity and redistribution of wealth, Bitcoin’s hoarding principle remains unacceptable. He points out that a truly alternative economy would require a different kind of trust – socially distributed and local. This suggests to him that such a model may never be able to grow exponentially but its importance could be formulated through increasing interest in support of social capital. Lovink also exposes the lack of a wider recognition of the value of net culture and net critique by media and art institutions. He discusses in depth the views of American writer Jonathan Franzen, and wonders why net culture has reached a ‘resentment moment’ through a misconception that “true” culture resides outside of technology. While Franzen insists that we must remain ourselves, Lovink responds with the question: ‘What is the self outside of the big issues of our time?’ Franzen links net culture to rampant capitalism as the basis of his critique and by treating earlier technologies, such as print as superior. He is perhaps suggesting that they are less likely to be corrupted by quick profits. But this offers a very narrow and backward view of human agency; Lovink’s counter argument wins the day by allowing net culture to be understood as a tool we need to continually test and contest. He places value in narrating the complexity of the present no matter how fragmented or scattered it might appear. It is up to the public intellectuals, including artists, to experiment with mechanisms that meaningfully connect our dispersed social lives with net culture; this imaginatively argued theme reappears throughout the book. One of the more convincing arguments is the reliance of our culture on the ‘event’. Whether seen in purely political terms or more idealistically as the punctuation of our lives, an effort to create ‘non-eventful’ organizational forms is seen by Lovink as urgent. The culture of the ‘event’ permeates social movements via marches, demonstrations, festivals, and one might add, a parallel art typology of biennials, art fairs, openings, all based on the logic of the peak and isolated excitement rather than a more stable set of distributed processes. These are more likely to be less spectacular and remain embedded in an institutional matrix, which works self-reflexively from addressing labour conditions and social benefits to creating communities of interest and administering micro payments. By reconfiguring the internal architecture of the systems of visibility and power, from curatorial decisions to funding structures, more initiatives will have a chance to continue their growth. Events are staged to come and go in a flash, igniting short-lived, rootless media excitement. What we should be more concerned about is what happens in between those sparks, which according to Lovink only prove to be an exception. He encourages us to invest time in exchange of ideas, forming interest groups and building network architecture away from the ‘user-centred approach’ and closer to ‘task-related design’. His reluctance to fully endorse the user relates to fear of complicity. What is of greater value if not our contribution and ability to query the relationship between design and sociality, between singularity and belonging without offering simplified solutions? Gathering and sharing knowledge is best done when the commonality of purpose supersedes investment in the self. Pointing to the moral bankruptcy of the corporate world, Lovink discusses the insufficient attention given to governance models and design of the Internet, reminding us that building alternatives is our responsibility. The book makes us deeply aware of our own weaknesses in developing forms of sociality, what he calls ‘collective awareness platforms’ where ‘emphasis is placed on long-term collaborations over one-off events’. He reminds us that the social in social media means sharing amongst the users and doesn’t extend to collective ownership or public utility, recounting Jean Baudrilliard’s theorized transition from subject to consumer. The social is no longer a reference to society but a ‘placeholder for a collection of “weak ties”’ manifested in network form, an overwhelming wave, leading to the isolation of a so-called connected individual. Expressing disappointment with clicktivism of platforms like online petition site Avaaz, Lovink asks us to consider designing ‘inclusive digital sensibilities’, which would allow involvement with yet unknown others. It would perhaps not look that different from protocols that make us aware of the diversity experienced by urban populations where success is measured by contribution, co-existence and respect. Resisting the model of a ‘gated community’ could offer a useful guide for our online lives. Sensitized digital environments need to be collectively made and remade by people whose lives are touched by different circumstances and experiences. He is advocating a move away from the attention economy towards a ‘web of intentions’, breaking out in favour of unlike economy with the help of mutual aid instead of the ‘like’ recommendation industry. Lovink’s carefully chosen set of references doesn’t overload the pages with academic dead weight but stirs up confidence. By addressing the emotional intelligence of the reader we are released from a captive world of networks into a critically vivid space of social relations predicated on the value of vita activa. The force of negation implied by the subtitle, Critical Internet Cultures and the Force of Negation, makes a case for rejection as a necessary form of empowerment. Net environments often appeal to our desire and need to be loved, offering a quick fix, an instant approval from a person, an idea or a product. The clever simplicity of design in the decision-making process connected to this overwhelms our ability to question and to think independently. We need to develop new habits, where dissenting is valued as a positive response. It’s only then that we can experience the power of our own agency. He identifies the problem as the lack of a widespread critique or even skepticism towards net behaviour, and subsequently the limitations in producing a more politically aware netizen. Marysia Lewandowska is a Polish-born, London-based artist who has been exploring the public functions of archives, museums and exhibitions through a research-based practice resulting in exhibitions, publications and films. She has initiated projects involving the property of others to create new relations between forms of knowledge and ownership, activating reflections on the commons, the social and immaterial public domain. She is co-editor of Undoing Property? (Sternberg Press, 2013). See further: www.marysialewandowska.com. Weak connections are at the bedrock of social media and the marketing empire it protects. Geert Lovink’s work over the last decade on ‘organized networks’ proposes organized strong connections as tools to embrace and generate a commons that not only consists of small-scale experiments but is a large-scale infrastructure. If the commons is to be saved from the neoliberal fate of the Internet, we must consider those around us, and how to work closely with them towards a shared reality that is not governed by the oppressive regimes we claim to dispel.